Are you an entrepreneur, small business owner, or corporate marketing executive with questions like these? What viral marketing methods are most successful? What direct mail marketing tactics create the most new leads? How can I optimize my website and increase traffic? How can I motivate and retain my top sales reps? How do I choose the right Public Relations firm? What is podcasting and how do I get started? What outdoor advertising techniques work best? Get answers to these questions along with practical advice on over 100 topics. Written in plain English with short easy-to-read chapters, this book demystifies niche marketing by delivering easy-to-understand definitions and practical suggestions. “First, Best, or Different is one of those exceptional books that changes the way you think about marketing and entrepreneurs. I highly recommend this book.” – Manny Fernandez, Chairman Emeritus, Gartner Inc.
Every entrepreneur needs to know that to be successful in niche marketing you need to be first, best, or different. Being “first” can offer great rewards, until the other guys find out about what you are doing. Presuming the market is big enough for more than just your firm, it is highly likely that the competition has been studying the market opportunity just as long as you have. Instead of taking the plunge, they hesitated and decided to watch and learn from your successes and failures. Being the “best” in the eyes of your customers may seem like nirvana for entrepreneurs, but it can be exhausting. It takes an outright obsession to be the best and you always live with the fear that everyone else is out to knock you off the top of the hill. The bigger the market and the more competition, the more this is true. Being perceived as “different” in the minds of your customers is the core of a successful niche market strategy. If your customers believe that your product is different and better than the competition, you have struck gold. Your product’s actual differences are far less important than what your customers think is different. This perception is everything. A great product is not enough. You need to listen to John Bradley Jackson to prosper. Entrepreneurs constantly struggle with getting the business mix right. In a wired world, product and company information is available at the click of a mouse, so it’s no longer enough just to have a great product. Now, in order to stand out, you need to be, as John Bradley Jackson says, “FIRST, BEST, OR DIFFERENT”. But how? In his excellent book, Jackson shows us how. But this is not some MBA Professor’s theory. Instead Jackson lays out an action plan for success from the identification of markets all they way through to effective marketing and promotional strategies. If you already have a great product, congratulations! But to really prosper, check out the action plans contained in this book. You’ll be glad that you did. I just finished reading a great new book called FIRST, BEST, or DIFFERENT by John Bradley Jackson. It explains in easy to read, plain English what every entrepreneur needs to know about niche marketing and more. I found it to be a very comprehensive resource book that addresses all aspects of marketing and sales and I found myself wishing that it was available when we launched our business a couple of years ago. FIRST, BEST, or DIFFERENT is a practical guide for anyone in business – whether an owner trying to create a perfect niche, a marketer trying to differentiate their product in the marketplace, or an individual trying to carve their niche with in their company or community. All of these people and more will find nuggets, ideas and great suggestions on these pages. I highly recommend this book! Are you an entrepreneur struggling with niche marketing? FIRST, BEST, or DIFFERENT will take years off your ad-hoc approach and shorten your sales cycle. John Bradley Jackson goes to the heart of the matter bringing in insider information and secrets to small business. In my 25 years of consulting, this is the most valuable book I’ve read on effective marketing techniques. Read it ‘first’ before your competitors! -Jim Kelton, President, Altius Information Technologies Inc. If there ever was such a thing as a marketing cookbook for entrepreneurs, John Bradley Jackson’s FIRST, BEST, or DIFFERENT is it. This book is filled with proven recipes for marketers who want to get their companies to the top of the heap and not break the bank in the process. I have found this to be a very logical, well reasoned and balanced book that mixes the practical, tactical and more intuitive elements of managing a business to make money. The author dispels outdated notions of sales and marketing strategies and challenges readers to carefully know their customers, their businesses and most importantly, themselves. This book is a resource that can be returned to time and time again for new initiatives, growth planning, or management audits. I highly recommend it. Successful organizations consistently apply the art and science of marketing to drive revenue, win market share and produce profit. Jackson’s book, FIRST, BEST, or DIFFERENT, demystifies many commonly misunderstood concepts of marketing and introduces the reader to useful and best practices of skilled marketers. Read it, apply it, and prosper! FIRST, BEST, or DIFFERENT has a simple message for the reader: to be competitive over the long run you need to do different things, or you need to do things differently. The author suggests that the trick is not to follow the herd or obsess about the competition; instead he challenges us to focus on personalizing your offering to better fit the customer’s needs. This specialization will be valued by the customer and you will be rewarded accordingly. Very cool book! Reading this book becomes addictive. Like small chocolates or fresh, hand-picked berries, there is something satisfying in every bite. Each one of the 106 concise, funny, insightful chapters begins with a relevant quote from some famous poet, philosopher, comedian or author, follows with a meaty discussion of the dos and don’ts of the subject, and ends with a list of action items or next steps. There’s no fluff in this book whatsoever; it is straight to the point, and filled with the kind of guidance only a seasoned executive could have acquired. I highly recommend it. Excellent Book. A must for anyone in the marketing field. I had great success using this book for teaching university level marketing. The use of real world examples connects with the students. Student feedback was very positive. The book is fun to read. In the inventive and enlightening marketing book for entrepreneurs, FIRST, BEST, or DIFFERENT by John Bradley Jackson, a wealth of ideas are shared about how the entrepreneur can best position for success. While the book is designed for business owners under the conventional definition of “entrepreneur,” its simple and straightforward thinking offers insight to us all about enriching ourselves in a new and broader definition of living entrepreneurially. John Bradley Jackson has written an excellent marketing guide for entrepreneurial organizations. FIRST, BEST, or DIFFERENT should be required reading in any business school. The division of the book into small segments with an interesting and appropriate quote at the beginning of each segment makes for fast paced reading. First-time entrepreneurs should use the book as a road map to success and long-time entrepreneurs should use it as a periodic review of their operation. I have been a small entrepreneur for over 40 years and after reading the first pages, I noted that I should start sending thank you notes with our invoices and start using focus groups for our new ideas. 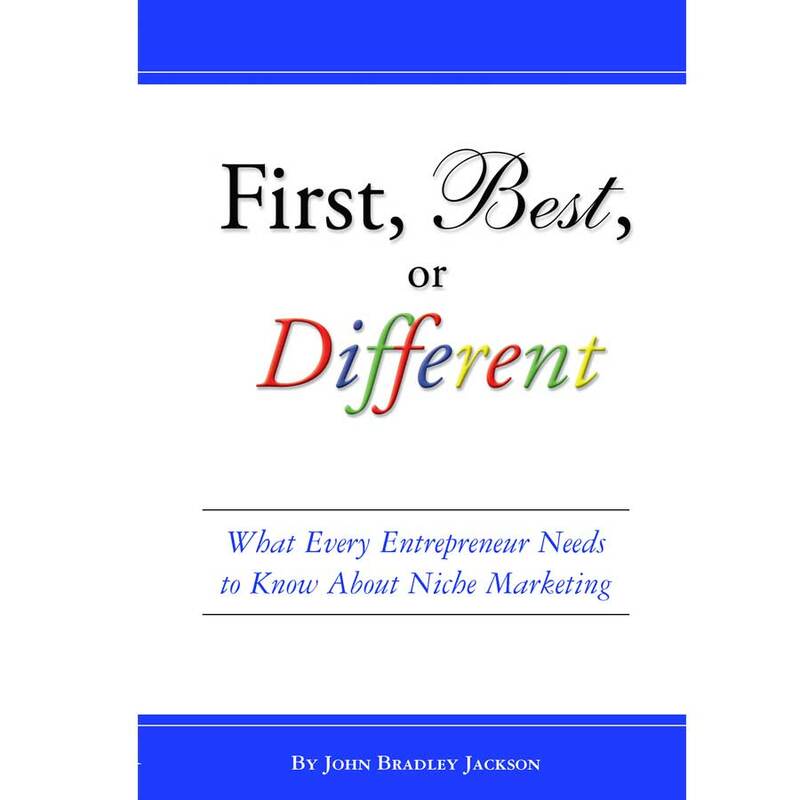 John Bradley Jackson’s “first” book is “different” and is “best” for small entrepreneurs. John Bradley Jackson flushes out the cobwebs from stodgy, corporate business paradigms (like the “4 Ps of Marketing”) by using 21st Century strategies that entrepreneurs can use, particularly the 4 Cs of marketing. From the first chapter to the last, John’s message is about building relationships to grow your business. He presents his ideas in short but power-packed chapters that talk about concepts and very do-able action items. What impressed me the most? It’s the way he uses the principles of honesty, sincerity and integrity to build and apply a marketing plan. Simple, direct and to-the-point. I really enjoyed this book! John Bradley Jackson’s book lays out sure-fire techniques and strategy around being a better marketer. I found it to be an easy-to-read book. It helped me get smart about some of the issues I’ve been struggling with. I now feel like I have a better handle on how to approach marketing. I would highly recommend this book to anyone who is running a business and is in the process of thinking through marketing issues. -Greg Jordan, Sr. Account Executive, Yahoo! I just finished reading FIRST, BEST, or DIFFERENT by John Bradley Jackson. I am amazed at the work. Every page has gemstones and some pages have 5 caret diamonds of sage counsel. And, the book is an easy and enjoyable read thanks to the author’s clear style and superb grasp of the material. One of the best parts is that Jackson touches on the most recent tools for marketing-cell phones and text messages. Wow! FIRST, BEST, or DIFFERENT is like opening a beautiful present that leaves you speechless. The messages are just what I wanted and needed as a small business owner and entrepreneur. John Bradley Jackson provides the perfect blend of the practical, analytical, creative and thought-provoking to show us the way to success! A wonderful tool and great resource for any business person! Jackson breaks it down and gives it to you straight so you can begin making a difference in your company right away. My company is seeing great results as we continue to employ the tactics and methods Jackson shares in this book. Due to its conversational tone and bite-sized chapters, it’s such an easy read. FIRST, BEST, or DIFFERENT will be your right hand man! -Kareena Vasquez, Account Manager, Swire Marketing, Inc. I wish I had this book about 5 years ago when I started a business. FIRST, BEST, or DIFFERENT should be kept somewhere where it is easily reached because that’s exactly what you’ll be doing on a regular basis. If you’re a small business and don’t have a PR strategy, aren’t utilizing the Internet, don’t have a focused target market, and especially if you’re in a niche – this book will literally transform your business as soon as you start reading. The chapters are short and split up by topic and written to be easily read and instructional. It’s easily the most satisfying read I’ve ever done because of how much sense it made for me and my business. I didn’t realize how many opportunities I *was not* taking advantage of for years – things so simple you’d be amazed – and I was as soon as I started reading! FIRST, BEST, OR DIFFERENT is a book that will help you to grow your business, whether your business is selling advertising or is an off-road manufacturing business. The book is easy reading and gets to the point—it is full of useful information for small, medium, and large businesses. I highly recommend it. While I used the book originally as a textbook in a university marketing course, it has continued my education with the ever changing market today. I constantly find new ways to apply the books principles into my job as a marketing coordinator. If you want to understand the complex minds of today’s information savvy customers, this book is definitely worth the time to read. Whether you are an entrepreneur of a small company or an intrapreneur in a big corporation, this book will add value to your pursuits. It provides an extensive coverage of the field of marketing–from the fundamental paradigms to the author’s experiences as a marketer. What I like most about the book is it stays current, especially within the realm of the internet. John’s book will be able to elevate or even recreate some of the ideas you currently have. John Bradley Jackson is the real deal. I’ve implemented his advice and created a successful niche product. I’ll never look at marketing the same way again. “FIRST, BEST or DIFFERENT is an absolutely excellent book. I first read this book just over a year ago and its helpful insights continue to help me develop great marketing ideas of my own. The topics that are covered are vast and the knowledge provided is in depth but not overwhelming. The structure of the book and short chapters allow for the book to be quickly read and for its knowledge to be passed on quickly. This book is an asset to the thought process of any business person and should be an essential tool in the toolbox of all marketers, from professionals to students. In summary, BUY THIS BOOK! It will make you a better business person.